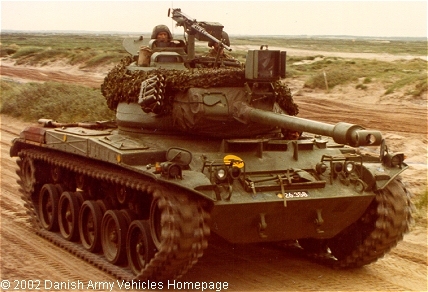 Danish Army Specific: 53 vehicles of the M41 Walker Bulldog was delivered as part of the MDAP program in 1962 to replace the M24 Chaffee and the M10 "Achilles". All were given a "mid-life update" by Falck Schmidt, Odense in 1969 - 1971 (turret, gun, engine and electric's) and again in 1985 - 1987 by DISA, Herlev (price of 7 mill. DKr. each) to DK1 standard. Historical: Origin of the M41, initially known as the "light tank T37", began in 1949 to replace the M24 Chaffee. The M41 "Walker Bulldog" Tank was a light tank designed to be air-transportable and to provide mobile firepower in combat. The M41 was originally named "Little Bulldog" but was renamed in honour of Gen. W.W. Walker who was killed in a jeep accident in Korea in 1951. The M41 was produced in the 1950´s by Cadillac´s Cleveland Tank Plant, Ohio, with first production models completed in 1951. By 1953 the M41 Bulldog had totally replaced the M24 Chaffee in the US Army, where it remained until the late 1960´s, when it was replaced by the M551Sheridan. Also A1, A2 and A3 models were produced differing in gun control and fuel systems. The chassis including drive train was shared with the M44 and M52 SPG´s and the M42 "Duster" SPAAG. When production seized in 1954 a total of 3.729 units (M41 only) had been manufactured. The M41 has been exported to Brazil (300), Chile (60), Denmark (53), Dominican Republic (12), Guatemala (10), Japan (150), Philippines, South Vietnam, Somalia (10), Taiwan (675), Thailand (200), Tunisia (10) and West Germany. A Taiwanese upgrade is known as the M41D. This included a local manufactured 76 mm gun, diesel engine, reactive armour, laser rangefinder and a ballistics computer. Length: 8.16 m (318 inches (including main armament)). Width: 3.20 m (126 inches). Height: 3.07 m (119 inches). Weight: 23.495 kg (51.800 lb.). Armour: 13 - 38 mm. Engine: 6-cylinder Continental or Lycoming AOS-895-3, 14.669 cm3 (895 cubic inches) displacement, supercharged, air cooled. Horsepower: 500 at 2.800 rpm. Transmission: 2-range GM Allison CD 500-3 Cross-drive transmission with torque converter. without preparation: 1.00 m (39 inches). Fuel capacity: 530 liter (116 gallons). Range: 160 km (100 miles). Armament: Armed with a 76 mm gun M32, a 7.62 mm and a 12.7 mm (cal. .50) machine-gun. 65 rounds of 76 mm, 2.175 rounds of 12.7 mm and 5.000 rounds of 7.62 mm ammunition were carried. Additional: AEG-B30 IR-projector. Mounted with AN/GRC-7 or AN/GRC-8 radio.